Over his long and distinguished career, Sonny Rollins has made many dozens of albums. Among those recorded during the Fifties, Prestige’s Moving Out (OJC 58) and Saxophone Colossus (OJC 291), Blue Note’s A Night at the Village Vanguard, Riverside’s The Sound of Sonny (OJC 29), and Way Out West on Contemporary qualify as all-time Rollins classics. 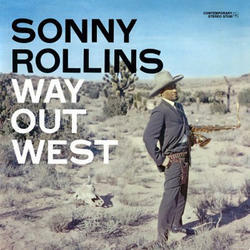 The session for Way Out West, Rollins’s first ever in California, was called for 3 a.m. to accommodate everyone’s busy schedules. Sonny, who could never be accused of overstatement, announced after four hours of recording: “I’m hot now.” With Ray Brown, Shelly Manne.